Or maybe they’re hunting for new jobs, leaping at new opportunities, leaving you vacancies to fill. Perhaps the same mistakes are being made in your firm’s workflow, time and time again. Your clients can’t get clear answers to their questions because you don’t have their files updated and at hand. These speedbumps (and more) seem disparate but in fact quite often have a source in common – you. As the boss a lot of lost productivity can be laid at your doorstep. How do you tell when the problem is you, and what can you do to boost your firm’s productivity? 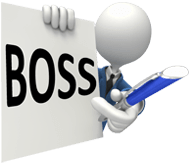 Let’s take a look at four of the more common mistakes big bosses sometimes make and what can be done to eliminate them from your firm. People don’t tend to specialise on a whim – they educate themselves in job niches that they either enjoy and/or find to be a profitable use of their time. If you’re hammering square pegs into round holes (beyond a temporary emergency situation) you’re probably not doing yourself any favours. Employees may be too intimidated to tell you that they don’t want their new position, and may even fear being fired because they said, “No thank you” to you. Are there people who would like to try new jobs and to learn new procedures? Of course, especially if they’re being pushed upwards. But it’s a mistake to assume that it’s automatically going to be fine. Because when it’s not fine, you’re staffing your firm with someone who is going to look at their work as a slog, as something that needs to be endured, and that is a guaranteed method for making sure that your productivity gets slowed way down. Your best bet to counter this problem is to keep an open-door policy; make it a part of your firm’s overall culture that employees feel free to bring you their concerns. Even better, make it a part of your schedule – perhaps once a week have a set meeting where you get together for 15 minutes with an employee for a meeting about them. Ask them if working at your firm is turning out to be the experience they expected. If not, why not? Phrasing it in this manner puts the onus on you – if there’s a problem it’s at your end instead of theirs, which may let them feel more open to telling you their concerns. With those concerns aired out, you’ll have a better idea of how to best utilise your team members, getting the most out of them as well as giving them a reason to enjoy the work they do for you. Everybody knows that clarity is key in making a firm work like a well-oiled machine. Great… but how do you actually achieve clarity? We’ve already mentioned meetings with specific purposes. This goes both ways – for meetings where you find out what your employees have on their minds, as well as meetings where you lay out what goals you have for your firm. Do you have a goal for your firm to achieve exactly 1 year from now? 5 years? 10? If not, make some. Write them down on your calendar. Break them down into achievable monthly sub-goals. And then hold a meeting specifically to relate these goals to your team. This will get them on board by letting them understand the moves you’re going to be making in the coming months. It’s much better for your team member to understand (and be motivated by) a clear picture of how they’re contributing to a whole. They’ll know that since they’re Link C in a chain that they have to get their work done in a timely fashion before Link D can get a start. As for the day-to-day work, start using systems. Systems are documented procedures for just about every task you do in your firm, covering every single step. These systems, instead of impeding your employees, actually free them up in their daily work life. It will be clear to them what they are expected to do every step of the way, instead of constantly having to ask you (or a manager) for your preferred method for Job A or Task B. It also eliminates the need for managers to be peering over their shoulders – micromanaging is a waste of everyone’s time and is an indication of a lack of communication. You don’t want people further up the ladder suffering lesser consequences for the same infractions that might result in a lower-rung employee receiving a serous wag of the finger. If Betty on the first rung gets in trouble for stealing office supplies, then Bob on rung five should receive the same reprimand. There’s no such thing as a useless part in an engine; the same thing goes for the engine of your firm (your people). They should all receive the same amount of maintenance. Having everyone on the same page when it comes to what is expected of them means that they won’t waste your firm’s time with constant second-guessing, or having to have meetings with managers so that they can get a clear picture of where they stand in relation to a given situation. If your firm never has any friction between employees at all then consider yourself blessed. For the rest of us we’re going to need an outlet for employees to safely air their grievances about each other. Do not let these grievances linger in the hopes that they’ll go away on their own. They probably won’t, and in the meantime they may very well grow; the employees at the centre of a conflict may start gathering allies, and then you’ve got a great big split right down the middle of your firm. Office politicking is an action, and as an action it takes time away from your employees that should be sent working on clients’ files. Simple and direct is best in this case. Pull the employees in question aside immediately and get them to get it off of their chests. As we said in the last point, productivity mistakes are not likely to get better on their own. They can however snowball to the point where they do some serious damage to your workflow and to the internal structure of your firm. The sooner you smooth the problem areas out, the sooner you can get back to being a productive firm.